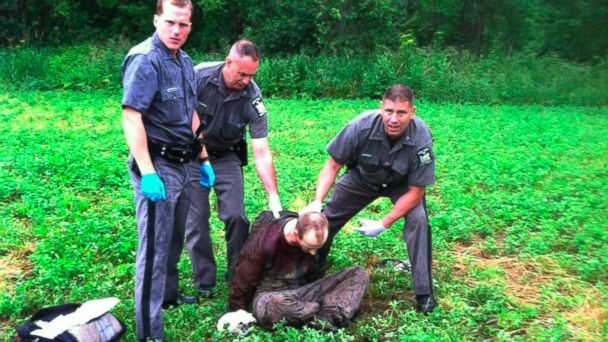 Convicted murderer David Sweat is hospitalized in critical condition after being shot and captured today, more than three weeks after he escaped from a maximum security prison in upstate New York. "The nightmare is finally over," New York Gov. Andrew Cuomo told reporters this evening. Sweat was caught in the area of Constable, New York, approximately 1.5 miles south of the Canadian border, officials said. Authorities believe Sweat was trying to make a final break toward the border, officials said. At about 3:20 p.m., State Police Sgt. Jay Cook was alone on a routine patrol when he spotted Sweat on a road near Route 30 and ordered him to stop, a source familiar with the investigation said. When Sweat started to run, the sergeant opened fire, the source said. Officials said Sweat was shot twice in the torso. Sweat was not armed, New York State Police Superintendent Joseph D'Amico said. Sweat was in critical condition at Albany Medical Center, an official there said Sunday evening, after being transferred from Alice Hyde Medical Center in Malone, New York. No law enforcement personnel were injured during the capture, an official briefed on the manhunt said. Sweat has not yet been interviewed by investigators, D'Amico said. The man who escaped with Sweat, Richard Matt, was shot and killed by a border patrol SWAT team Friday afternoon in Elephant's Head, New York, just 50 miles away from the prison, after he was spotted by a law enforcement officer in the woods. Matt and Sweat may have been using picnic-style pepper shakers to throw their scent off the dogs tracking them, D'Amico said today. Authorities had found Sweat's DNA on remnants of food about a mile from where Matt was shot and killed. On Friday afternoon before Matt was killed, officials announced they had reason to believe Sweat and Matt were planning to head to the border in a final play for freedom. As a result, U.S. and Canadian law enforcement sent in reinforcements in an effort to both squeeze the escapees and keep them from potentially making it out of the country. Today Cuomo called the escape "an extraordinary situation in many ways." "If you were writing a movie plot, they would say this was overdone," he said. "They were killers," Cuomo said. "Mr. Matt killed at least two people. Mr. Sweat killed a sheriff's deputy ... in a savage, savage way." Matt was serving 25 years to life in prison after he kidnapped and beat a man to death in 1997. Sweat was serving a life sentence after he was convicted of killing a Broome County sheriff's deputy in 2002. Matt and Sweat used power tools to cut through the back of their adjacent cells on June 6 at the Clinton Correctional Facility in Dannemora, New York, about 20 miles south of the Canadian border, police said. They broke through a brick wall, then cut into a steam pipe and slithered through it, finally emerging outside the prison walls through a manhole. More than 1,000 corrections officers and law enforcement officers were involved in the search. Cuomo said today, "This was an unprecedented coming together of law enforcement on every level." The investigation is ongoing to find out who was involved in the escape, Cuomo said. There is also an investigation into the systems at the prison. Two employees at the prison, tailor shop employee Joyce Mitchell and corrections officer Gene Palmer, have been charged in connection with the escape. "Anyone ... who was guilty of cooperating in this escape will be fully prosecuted," Cuomo said today.